Marc graduated from Washington University in St. Louis with a BA in Mathematics and History. While an undergrad he studied Hebrew and ran competitively. After college, he moved to Israel for a year to teach English and establish running clubs across the country. 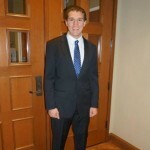 In 2013, Marc began his study of law at Washington University. He spent his first summer doing defense work for the Navy JAG Corps and his second summer working on government contracts for the Army JAG Corps. Marc has recently commissioned as an Ensign in the Navy reserves and will become an active duty member of the Navy JAG Corps in October 2016.